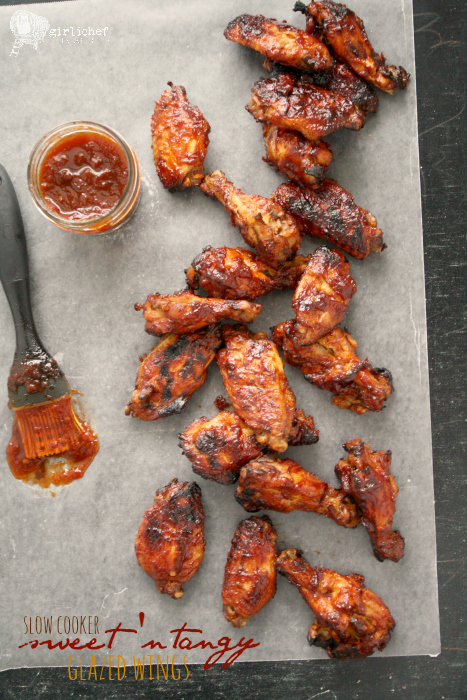 Until recently, I'd never really thought about making chicken wings in the slow cooker. It was either baked, fried, or if I happened to think about it while the grill was fired up, I'd throw some on there. I don't know if I just didn't pay attention before, but as soon as I saw one recipe for crockpot wings, I've been seeing them around every corner. It's like the buying a new car syndrome (see a beautiful car, buy it, then suddenly everybody and their mother is driving the exact same car). I figured it was finally time to throw some wings in the slow cooker and see what came out. I bet you can guess. Tender deliciousness, of course. I mean, they were cooked in a slow cooker! The result was a batch of wings just threatening to fall off the bone. But boy, were they ugly. Half the fun of eating wings is a crispy skin, and obviously you can't achieve that in a wet environment. The trick is lifting them carefully from the crock, setting them onto a rack, and then saucing them up and sliding them under a hot broiler. That skin will crisp up in no time, and all you have to do is give it a couple of sauces and a couple of turns. Minimal finishing work for such amazing results. I have a sneaking suspicion that the majority of my wings in the future are probably going to come from my slow cooker. 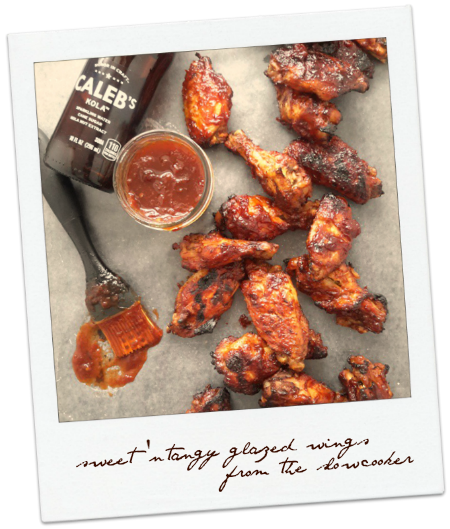 Tender, slow-cooked chicken wings glazed in a sweet and tangy sauce made from cola, vinegar, and chipotle chiles. Perfect game day eats! Cut the tips off the wings (discard or reserve for making stock). Cut the remaining wing at the joint to separate the flats and drumettes; place in slow cooker. Pour 12 ounces (1 can or bottle) of the cola over the wings, cover, and cook on LOW for 4 to 6 hours. In the meantime, whisk the remaining ingredients together in a medium-sized pot; boil until reduced to about 1 cup, 15-20 minutes. Reserve the sauce. Preheat the broiler. Line a tray that will fit under the broiler with foil; set a rack on top of the foil. Lift the wings carefully out of the slow cooker and place on the prepared tray; discard liquid in slow cooker. Brush the wings with a good coating of the sauce and broil until the skin has crisped and caramelized in spots, 10-12 minutes. Flip and brush with remaining sauce; place back under broiler for another 5 minutes or until the sauce still looks slightly "messy". Flip and brush one last time, return to oven for 3-5 minutes. Serve immediately with remaining sauce, if desired. 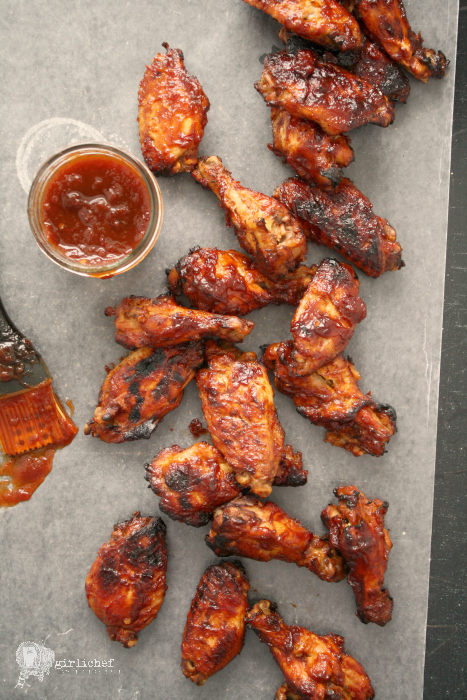 Have you tried making chicken wings in your slow cooker or crockpot yet? Do you finish them the same way? What's your favorite way to sauce them? I'd love to know!